Considering the volatile state of the oil and gas industry, news this week that Chevron CEO John Watson plans to step down wasn’t a shock to anyone who was paying attention. Chevron is No. 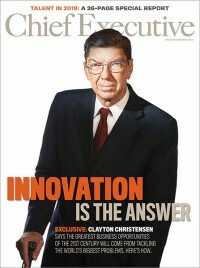 19 on Chief Executive and RHR International’s CEO1000 Tracker, a ranking of the top 1,000 public and private companies. As oil prices have tumbled to record levels over the past few years, companies, both large and small, have been forced to make necessary adjustments in budgets and workforces. Some estimates indicate that over 400,000 jobs have been eliminated in the past three years in North America alone. Training and development budgets were slashed, executive development activity has been curtailed, and significant downsizing programs resulted in many high-potential employees and next-generation executives losing their jobs. It’s exacerbated an underlying issue which many executives and leaders were already acutely aware: Although the oil and gas pipelines might be in great shape, the leadership pipelines are not. The broad oil and gas industry has had great success in recruiting and developing leaders from the baby boomer generation. As they began entering the workforce, new technology was emerging, engineers were plentiful, and opportunities abounded for ambitious, smart, and motivated individuals. Healthy internal competition drove people to excel, and although it was still difficult to identify who was going to be able to scale and assume broader responsibilities or executive roles, when executives topped out or derailed, there was almost always a deep bench to draw upon to fill the openings. The generation X demographic looked at this industry filled to capacity with baby boomers and in general opted to take different career paths. They pursued careers in emerging fields driven by information technology, innovation, and entrepreneurship with the flexibility to be more self-directive in their career choices. The impact was not immediately felt in O&G because there still was an abundance of talent in the leadership pipeline. However, as the millennial generation began to enter the workforce and the baby boomers began to enter the twilight of their careers, shortages in the leadership pipeline became far more evident. One of the key challenges faced by the industry was how to make itself more attractive to millennials by appealing to the values of that generation. The industry has since made tremendous progress and begun adjusting to the interests of the millennials and to society’s changing mindset toward O&G. How? By placing a greater emphasis on sustainability and the value the industry brings to the lives of people all around the world. This shift has helped to open more Millennials’ minds to the possibility of careers within the industry. 1. Knowing who is “ready now” to assume executive responsibility. 2. Identifying and developing emerging talent with the potential to one day step up and assume significantly greater levels of responsibility. One thing is certain: Traditional means of building a leadership pipeline popularized during the baby boomer era will not meet the needs of today’s O&G industry. Training large groups of people and hoping that—through attrition and a bit of luck—the best talent will emerge is a fundamentally flawed approach during a volatile time for the industry where next-generation leaders need to be identified and groomed with precision. Our research and development efforts at RHR have enabled us to create our “Readiness for Scale” assessment approach. By identifying high-potential leaders with precision, developmental activities can be personalized and focused on the critical needs of the rising executive in the context of the business demands. Building the leadership pipeline becomes a more robust and precise process; this offers organizations greater flexibility to provide the key developmental business experiences needed to build depth in the pool of rising talent. As has been documented many times, even the most well-prepared rising executive can stumble when given the first enterprise-level C-suite role. Our experience tells us that it is not because the leader lacks talent, but because he or she stumbles with the onboarding and integration into the C-suite. Many of the most successful transitions occur when rising executives engage with a C-level coach not just during but before their transition. Executive coaching prior to the ascent to the C-level provides the right consultative guidance to build the necessary levels of confidence, self-awareness, and humility needed to lead a business, lead people, and most importantly—lead one’s self. Although the immediate future of the O&G looks to be more stable following several years of volatility, the astute observer knows the industry still faces a big problem with regard to the leadership pipeline and the availability of “ready now” executive leaders. The organizations that address these issues now will be the ones who accelerate and outperform their competitors who have chosen to ignore the fact that with Baby Boomers exiting the leadership ranks at an ever-increasing pace, a crisis of leadership talent is looming. Michael Bleadorn is a partner in RHR International's Dallas office.